Sentinel Visualizer offers a variety of data integration options that allow seamless interoperability with your existing systems and data sources. 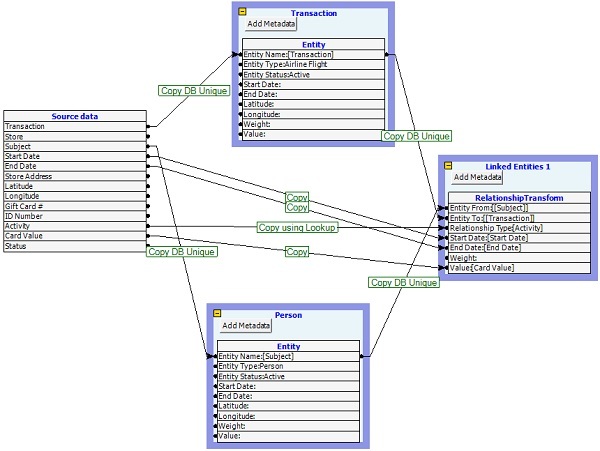 Sentinel Visualizer stores its data in Microsoft SQL Server databases. This industry standard and open platform lets you get to your data at any time. In addition to our automated processes to import, query and edit the data, you can also implement your own custom processes and connections to manage your data. Never worry about your data being stored in a proprietary format or an inability to share it. Quickly import data from a comprehensive variety of data sources. Use our Data Import Wizard to organize and classify information. Import entities, relationships, and metadata. Export data in a variety of formats, including structured XML and unstructured documents in Word, PDF, Excel, Text and HTML formats. Sentinel Visualizer includes a flexible Import tool. Point to any compatible data source, map fields, transform and organize data, and establish entity/relationship mappings. The wizard steps you through each part of the process. Full logging is supported during the import process. Many external data sources contain unstructured or non-normalized data. The Import Data tool offers the ability to run text-based metadata into structured, lookup-driven data. This provides optimum consistency and reliability in your Sentinel Visualizer knowledge Base systems. Unlike closed proprietary systems, Sentinel Visualizer has built-in support for exporting data to other systems. You can export data to structured XML, or to unstructured document formats such as email, Word document, Excel spreadsheets, PDF files, etc. The FMS Advanced Systems Group offers customized data integration services. We have developed custom data import, export, and live-link integration layers for a variety of customers in small, medium, and large volume environments.